"It was one of the most elaborate entrances in showbusiness!” laughs Mark Hamill when our sister publication SFX magazine asks him about his blink-and-you’ll miss it appearance in The Force Awakens. You know the one. You sit through the whole of the new, hotly anticipated Star Wars movie waiting for a glimpse of Luke Skywalker – having been reunited with Han Solo, Leia, Chewbacca, C-3PO, R2-D2, Admiral Ackbar, and even Nien Nunb along the way – and then you get barely a minute of an old bearded guy with a robot hand on top of a remote island. He doesn’t even have anything to say. Has any movie star ever had higher billing (he was second only to Harrison Ford) for less screen time? In the two years since The Force Awakens, Luke’s meeting with Rey on Ahch-To has become one of the most talked about minutes in cinema history. What was going through the former saviour of the galaxy’s head when his potential new apprentice handed him the lightsaber he’d lost in The Empire Strikes Back? Not even Hamill knew at the time. “[Director] JJ Abrams just said, ‘Turn around slowly, remove your hood...’” Hamill admits. “They were just going to run the camera for an extraordinary long period of time, and I thought I’m going to give them as much as I can, a range from bewilderment to suspicion to anger to doubt to great joy – I turned around one time and was so happy to see her!" "Then JJ could take what little puzzle piece he needed and do with it as he wanted. I wasn’t really sure what he wanted either. It wasn’t really specified, it was very enigmatic, for a reason, because I’m not sure they even really knew. It’s like a relay where they pass the torch, because JJ writes whatever he wants and then hands it off, then Rian [Johnson, Episode VIII director] writes up to the end of 8 and hands it over to 9 without knowing where 9's going to finish. It’s that old cliché line – so crazy it just might work!" It’s safe to say that Luke is more than a McGuffin in The Last Jedi, the movie alternatively known as Episode 8 – he’ll have actual dialogue, for starters – but we know surprisingly little about where he’s at. Why he’s chosen to live on the remote Ahch-To – home to cute critters the Porgs and, smart money has it, the first Jedi temple – is a mystery, for example, as is the exact nature of what he’s been doing since overthrowing the Emperor three decades previously. It’s fairly clear, however, that the wide-eyed boy who first followed Obi-Wan Kenobi on some damn fool idealistic crusade all those years ago is long gone, replaced by a more cynical, greyer model. 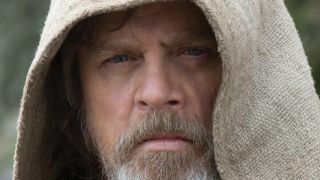 Indeed, Skywalker is now the wise old hermit living in exile – Hamill is older than Alec Guinness was when he played Old Ben – though his faith in the Jedi Order isn’t quite so unwavering. “As you know from the trailer, Luke says it’s time for the Jedi to end,” Hamill points out. “When I read it, I went ‘What!’ He was always the most optimistic character, who believed with all his heart and soul in what Yoda and Obi-Wan taught him. I said, ‘What could have happened in that gap that would make him be this cynical hermit who wants to end the Jedi?’"
That, of course, is a big deal for someone who’s been synonymous with lightsabers and X-wings for 40 years. While Skywalker is Lucas’s creation and the intellectual property of the Walt Disney Company, Hamill is the man who realised him on screen, all the way from twin suns and “power converters”, to “I’m a Jedi knight, like my father before me”. “I walked onto the Millennium Falcon set and I was just overwhelmed with emotion." In the 34 years since Return of the Jedi he must have had some ideas about where Luke might have ended up, though? “You would assume that after saving the galaxy the way he did he would become, like, a venerated member of the high Jedi order,” he laughs, “sort of like a cardinal or a monseigneur, who knows, maybe the Pope of Jedi!" "I said, ‘Oh, baby, would I love that?’ Not only could you get to play your evil twin, but what a great idea that you bring Luke back, and the audience starts noticing him undermining the heroes, cutting their fuel supply inexplicably, maybe even killing one of the supporting characters. It would be so mindboggling, and then of course the real Luke shows up and that mystery is solved. But there’s too much Luke, and it’s not my story anymore." While Lucas’s three Star Wars prequels were content to build a galaxy far, far away on computer monitors, the new breed of Star Wars movie has taken a more tactile approach. There’s a real appetite for building spaceships, sets and creatures for real – and it had a profound impact on Hamill. The remote Irish island of Skellig Michael, the real-world location standing in for the aforementioned Ahch-To, had a similar effect on Hamill – but for very different reasons. “I remember when I was out on the salt flats in North Africa making the first film,” he says. “I turned my back on the crew, and I looked out on the horizon... I was transported. I really felt like I was in a galaxy far, far away, because I had the robots and floating car, and I looked the way I did. I’d never been in a place like it. The salt flats are just 360 degrees of horizon, because nothing on earth can grow, so it’s unearthly. I never had that experience again when we were in Norway for Empire – snow is snow, I’d seen that before – and as beautiful as the forest of Endor was, it was like the sequoias that I had visited as a child." This feature originally appeared in SFX magazine. For more sci-fi news, previews, and reviews pick up a copy now or subscribe so you never miss an issue.